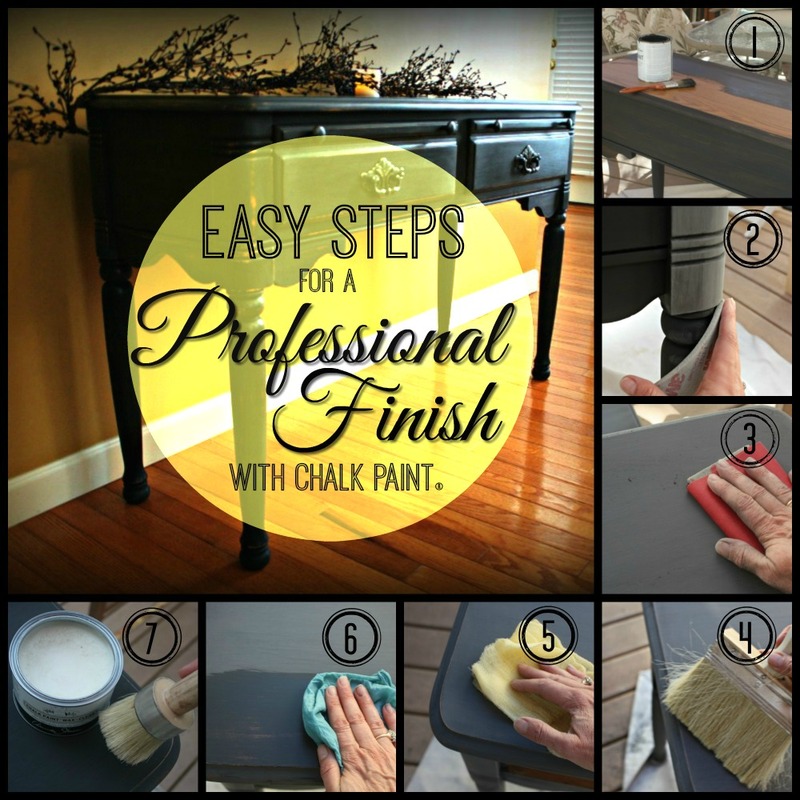 In today's post I will provide the basic step-by-step instructions of how to create a professional finish with Chalk Paint. 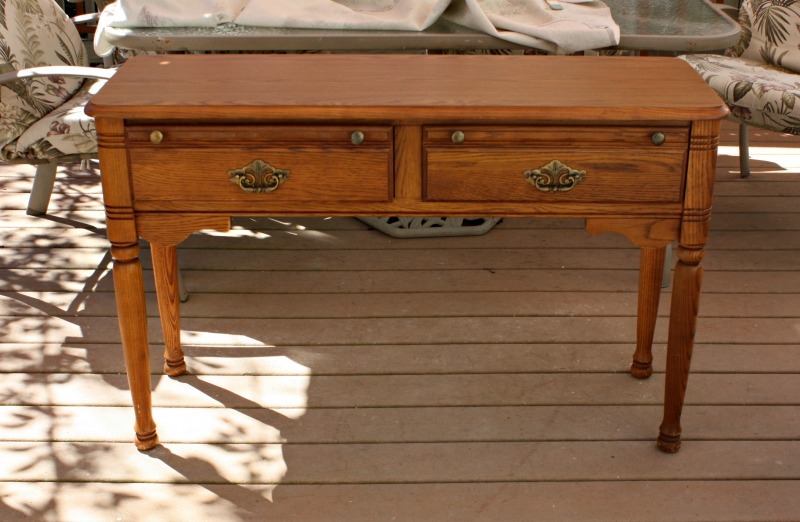 This process will help you transform your outdated furniture with outstanding results! Not every project requires all steps, for instance, I don't always sand or distress the paint, but for most projects I do. Follow the basic steps and be creative with your project and you will be a pro in no time! The project I am working on today is an oak table. 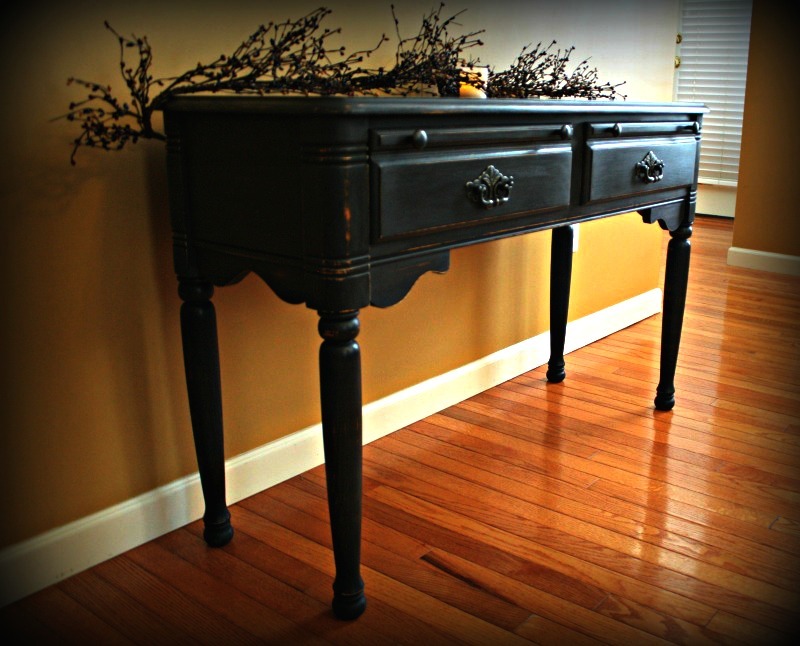 I plan to update it with a classic black finish using Graphite chalk paint. Applying the paint is my favorite part of any project! It's so fun to watch the project transform just by using paint. 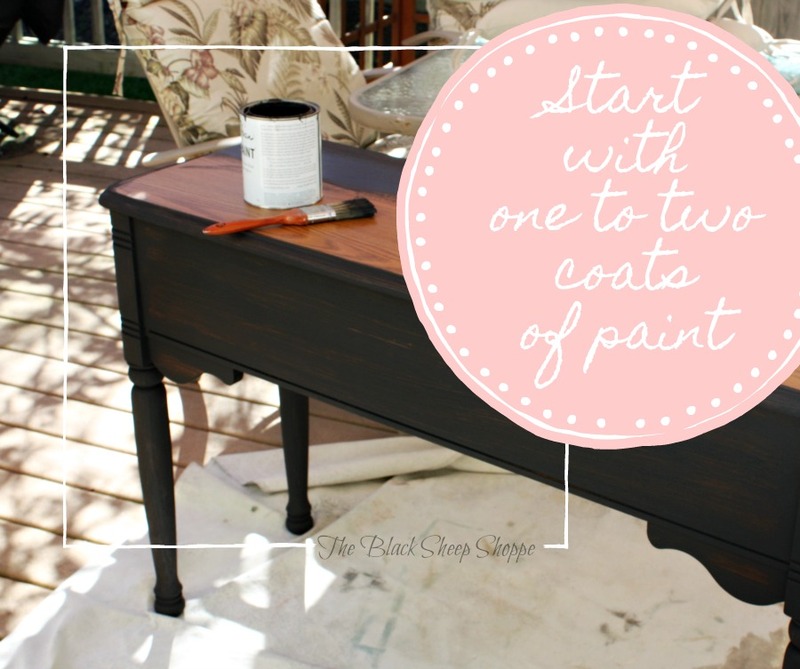 What I especially love about Chalk Paint is that it doesn't require a primer coat. Some colors with less pigments, such as Pure White or any of the reds, might require 3 or more coats to get complete coverage. 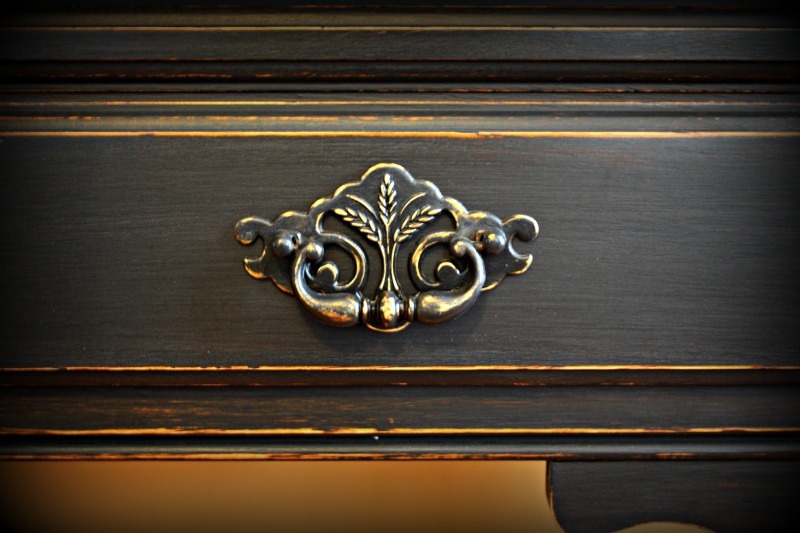 One coat of paint might be appropriate for a primitive or heavily distressed finish. The next steps assume that the paint will be sanded. Following the sanding steps in between coats of paint will provide the smoothest finish possible, although it's not strictly necessary. But it will set your project apart and give it a professional finish. 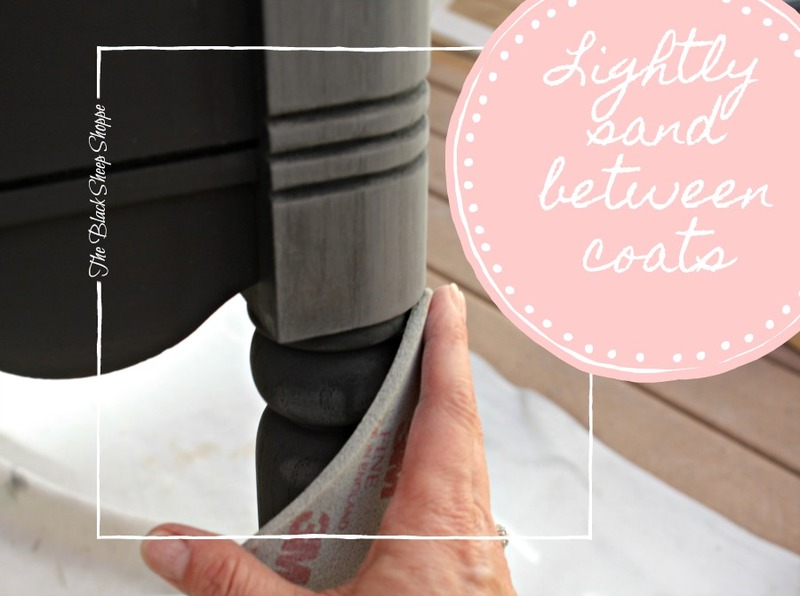 This step creates a lot of sanding dust, so be sure to take your project outdoors and put on a sanding mask. Sand back the paint using a flexible sanding pad. Using a light sanding technique will minimize unwanted brush strokes. Flexible sanding pads are especially useful on rounded edges, furniture legs, and spindles as it will conform to the curves and gives you more control. I cut the pads in half with scissors and they fit my hand perfectly. The pads are reusable -- simply rinse with water and let dry. STEP 3: Use 220-grit sandpaper to wear back the finish and apply distressing. After sanding back the paint with a sanding pad, I next use 220-grit sandpaper to continue smoothing the paint and to apply a distressed finish. For heavier distressing, first apply more pressure as you sand the paint. Increase the pressure gradually until you get the look you're after. 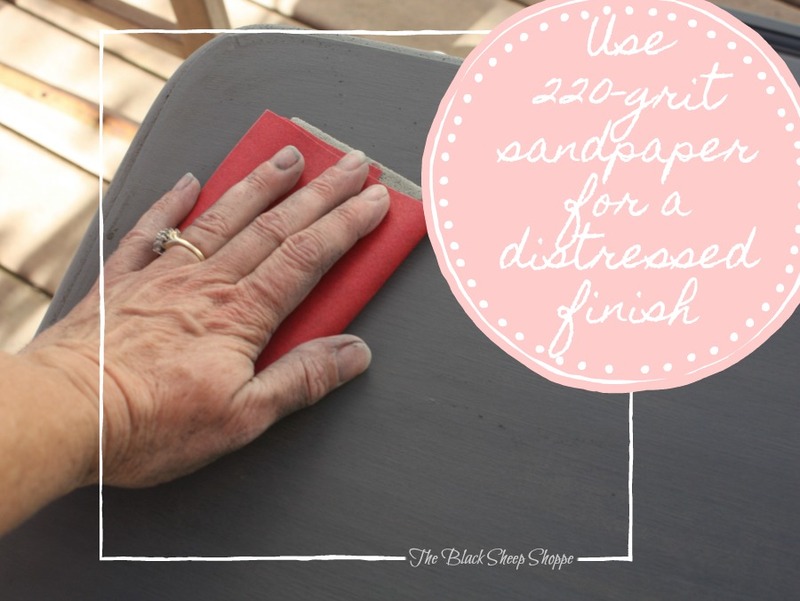 I wrap my sandpaper around my sanding pad for added control and to avoid over-sanding. 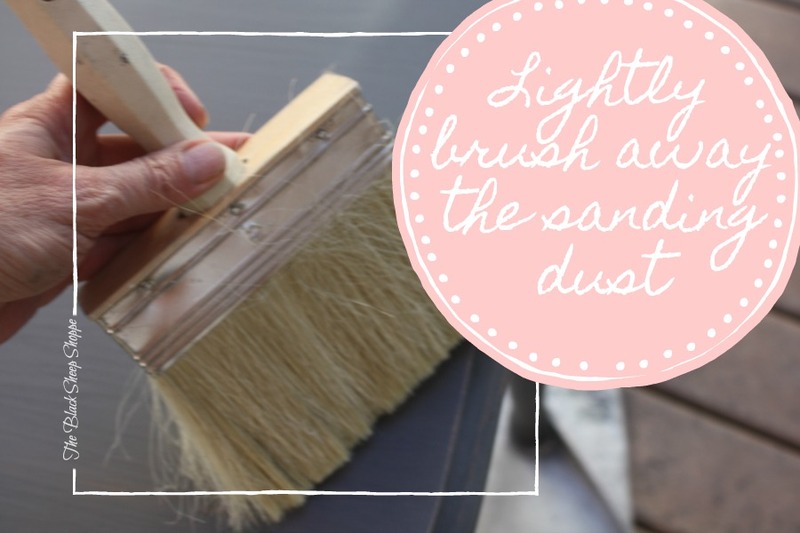 STEP 4: Use a soft brush to gently brush off excess sanding dust. There will be lots of sanding dust to deal with, so I use a large soft bristle paint brush to gently brush off the excess, trying to avoid creating a giant dust cloud. For flat surfaces, I use the brush to sweep the dust into a pile and then use a plastic grocery bag as a dust bin. STEP 5: Rub a tack cloth over the furniture to remove remaining sanding dust. Basically a tack cloth is sticky cheese cloth. I'm not a huge fan of the stick feel, but it's very effective at removing the excess dust, so it is a worthwhile step. Sometimes I will wear gloves during this step. 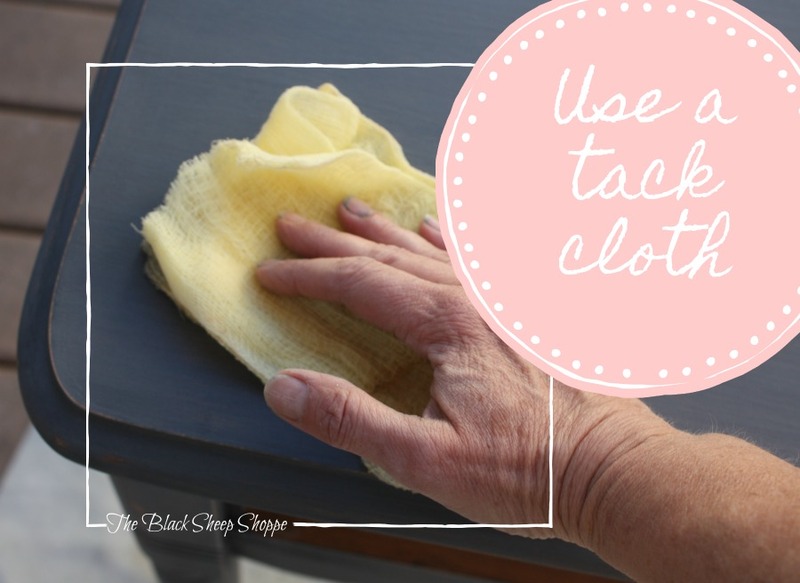 The tack cloths come folded, so simply wipe the furniture with the cloth. When the area of the cloth becomes full of dust, refold the cloth and continue wiping. STEP 6: Use a damp shop towel to remove any remaining residue. At this point most of the sanding dust is removed; however, I like to give it a final wipe down prior to waxing. 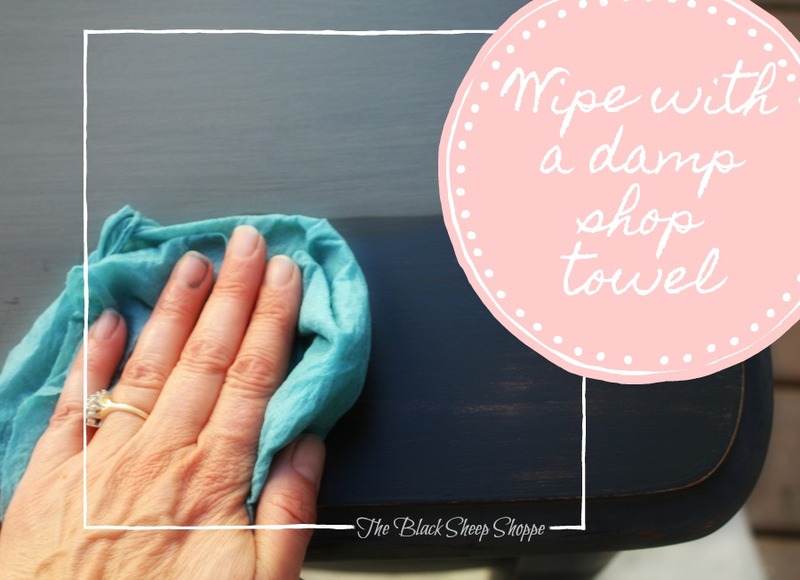 For this step I use a dampened shop towel which is basically a heavy duty paper towel, but it doesn't fall apart easily when wet. As the towel picks up residual sanding dust, I re-wet it, wring it out, and continue wiping the furniture. A lint-free rag, such as a t-shirt could also be used instead of a shop towel. However, I don't recommend a wash cloth as the rougher texture can actually remove the paint. If you're unable to take your project outdoors, then please see my tutorial "How to Sand Chalk Paint Indoors Without Making a Mess". STEP 7: Apply a coat of soft clear wax. The final step is to seal the paint with soft clear wax. The trick to applying wax is to not use too much wax. Test it out by using a small amount of wax and add more as needed to spread it evenly over the project. You don't need to use a lot of pressure when spreading the wax, just spread it around and lightly work it into the paint. I use a waxing brush, but you could also use a lint free cloth to apply the wax. However, I've found the waxing brush is faster and uses less wax. Working in small sections, use just enough wax to spread evenly over the surface. The color of the paint may deepen slightly as the paint absorbs the wax. Any wax not absorbed is excess wax. Use a lint free cloth to wipe off the excess. It is "dry" to the touch almost immediately; however, it can take a few weeks to fully cure and harden. Once the wax is cured it will provide a durable finish. Although not necessary, additional coats of wax can be applied for extra durability, but wait at least 24 hours or more between coats. I apologize for the poor photo quality of the "after" shots, but my camera is not working properly, so these are the best photos I could get at this point in time. Nevertheless I think you will see the overall beauty of the painted finish. Oak table painted in Graphite. 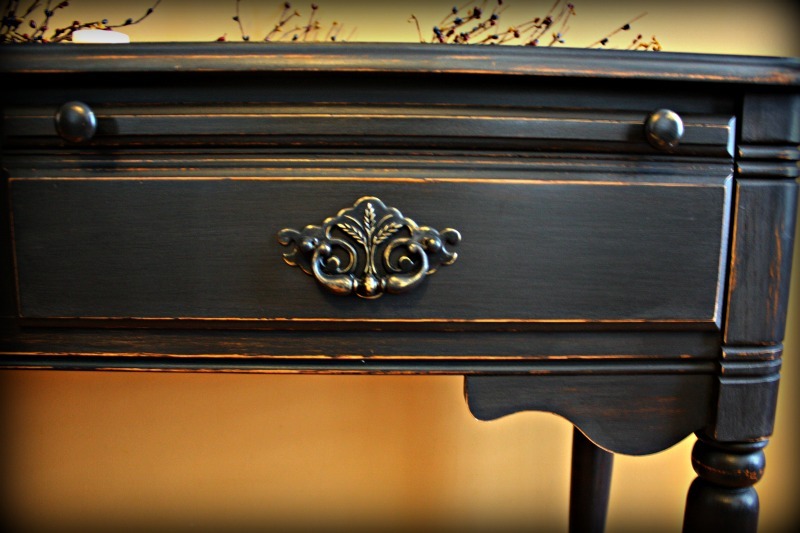 For this project I used two coats of Graphite (Annie Sloan Chalk Paint). I followed the steps listed above and finish with a coat of soft clear wax. The paint was sanded to apply a worn and distressed finish. 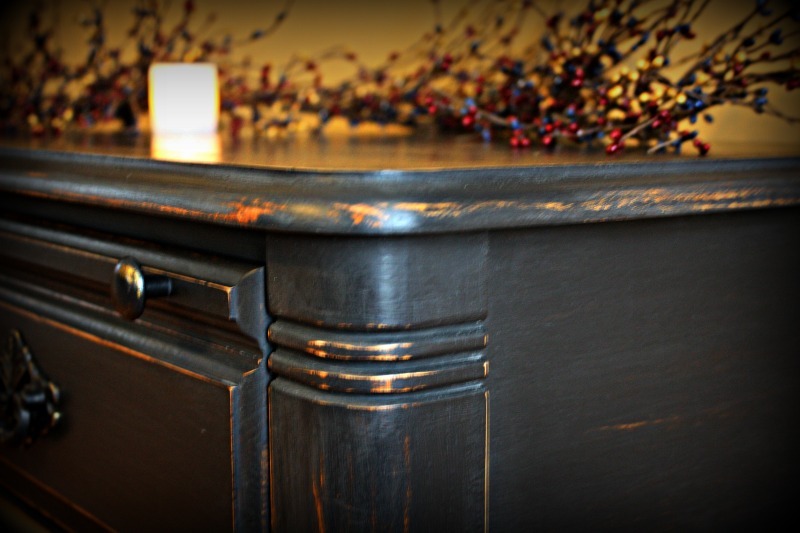 A closer look at the table top below shows how using sand paper can achieve a worn finish. wrapped around a flexible sanding pad. The flexible sanding pad is especially useful when working on rounded corners, spindles, and furniture legs. A flexible sanding pad is perfect for distressing rounded edges. I painted the hardware and then gently sanded back the paint to reveal the original finish for some added dimension. Original hardware was painted and then distressed. The photo of the drawer below gives an example of the different looks that can be achieved with various amounts of sanding. The drawer front was sanded smooth, heavier distressing was applied to the edges, and the trim areas were given a worn finish. and the worn finish in between. And a final look of the before and after. Once the basic steps are completed then additional finishes such as dark wax, glazes, etc. can be applied. But that's a post for another day. I hope you found today's post informative and I appreciate you stopping by! If you're working on a project and have any questions then feel free to comment or message me on Facebook. 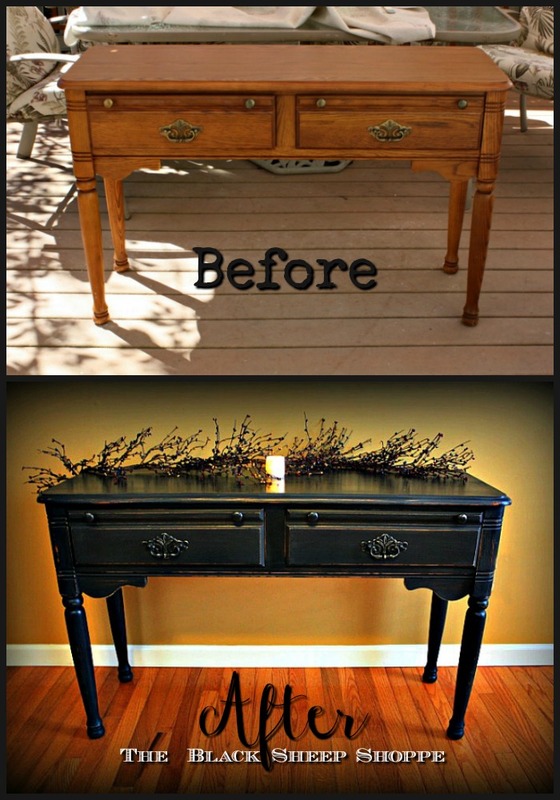 Annie Sloan products: Graphite Chalk Paint and and soft Clear Wax. Flexible sanding pad These come in a box of 20, but I cut them in half so I get 40! One box will last for a very long time. The pads also come in a superfine finish for even smoother results. I used to buy them individually at Home Depot, but as of the time of this post they no longer carry them in the store. Pip berry garland for decorating. I'm including a link because I always get a lot of questions on the garlands. 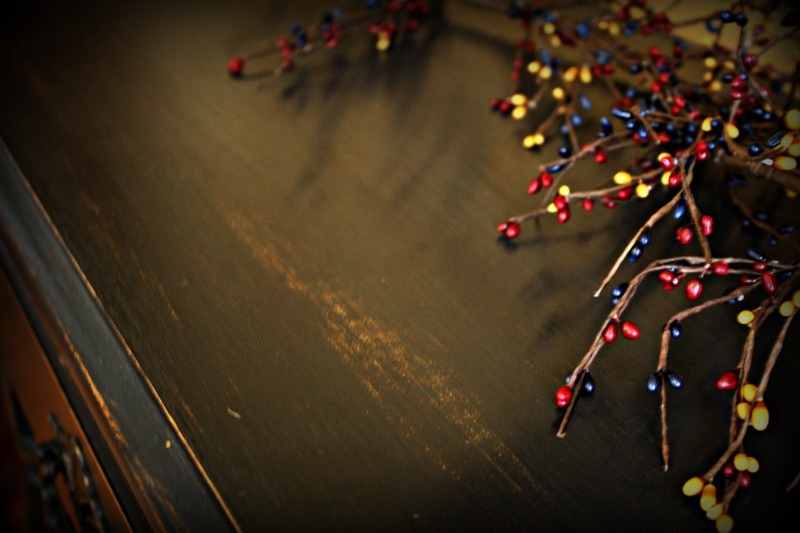 They come in lots of fun colors for all seasons and are very versatile for decorating. 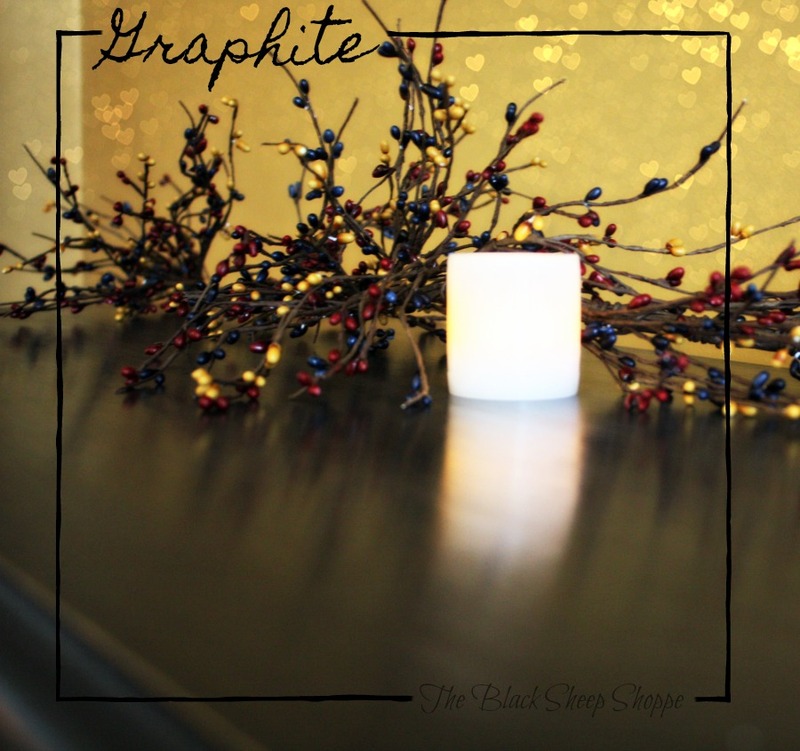 I use mine on my fireplace mantel, and also use to make into wreaths (just wrap in a circle and secure with wire). Fabulous, fabulous, and fabulous. Thank you! Looks great! Love the original casters - it gives the piece character. Your projects are gorgeous. I'm going to try my hand at some refinishing/painting furniture in the very near future. My question is... instead of wax as a top coat can you use another clear coat product like varathane or similar product over chalk paint. My thinking is what if I want to paint it again? How hard would it be to remove the wax and is it as durable as varathane? Thank you Kerri. 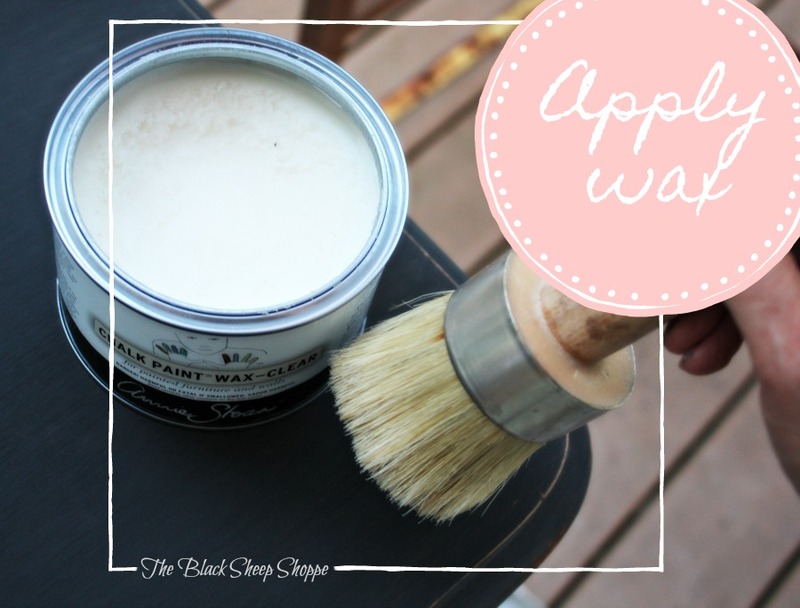 The wax was developed to work specifically with Annie Sloan Chalk Paint (ASCP) and will give it a beautiful finish. If you ever want to repaint it you can paint directly over it with ASCP. But if you prefer something other than wax then I recommend General Finishes High Performance Top Coat. It comes in either a flat or satin sheen. Once it's dry you can lightly sand it with a super fine grit sand paper for a smooth finish. If you use a different brand over a light color you might get some yellowing, so be sure to test it out first. Best of luck with your project! questions for you? Can you use a tack cloth to clean off saw dust in between sanding..I have so much old varnish to take off an old cigarette smelling cedar chest I have to clear the dust out of the way to see how the sanding is coming and second what do you put over the cedar chest knots before you paint it. Hi Sandy, Yes you can certainly use a tack cloth. When using Annie Sloan Chalk Paint you don't need to use a primer, but depending on the wood I sometimes put on a coat or two of clear shellac prior to painting. The shellac can help stop "bleed through" and can also block residual odors. If you still notice an odor after you finish your prep work then you might want to use a stain/odor blocking primer. Good luck with your project! Thank you Diena. 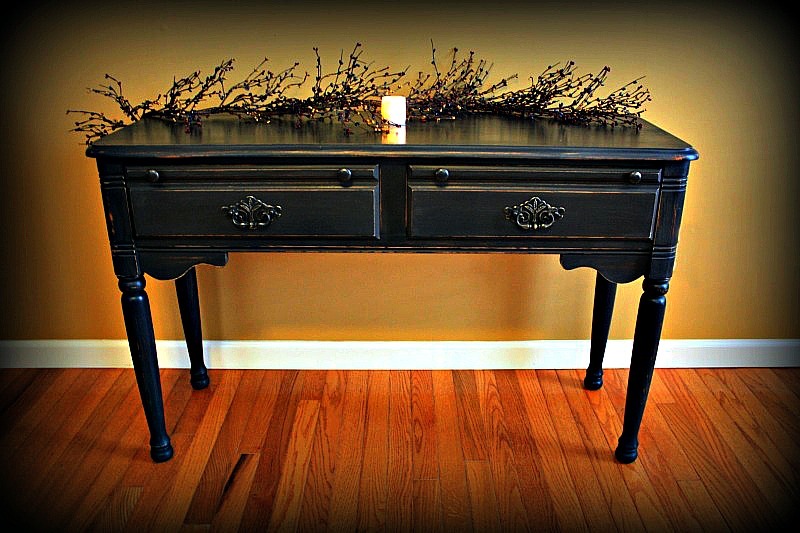 I love the classic finish of black furniture.